My involvement with the greater horseshoe bat nursery roost at Bryanston started (unofficially) over thirty years ago, in the mid-1980s. As a keen amateur bat-worker I’d already joined the Dorset Bat Group and was busy surveying houses, prior to remedial timber treatment being applied. In those days such work was co-ordinated by the then Nature Conservancy Council (now Natural England). 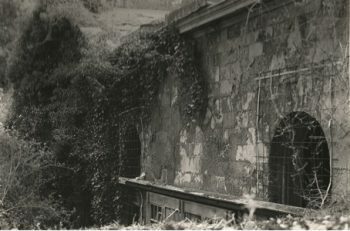 The building is all that remains of a large country Mansion built in the late 1700s by William Henry Portman, and partially demolished because of damp in the late 1890s. The remaining section of the 1778 house (The Old Kitchens) has had a variety of uses over the years: during WW2 it was used as a Billet for American soldiers, in the 1950s it was Bryanston ‘Old Boys Club’ and during the 1960s it was used as a handicraft workshop by the school. The poor condition of the building, and in particular the roof, meant it had not been used ‘commercially’ since then. 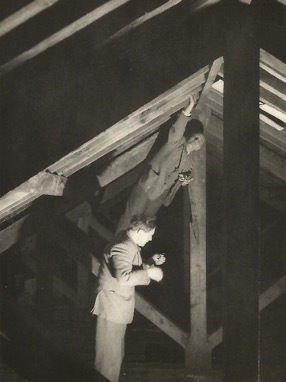 In those early batting days I would go, with a fellow bat worked Dave Mockford, and watch the greater horseshoe bats as they emerged from the building. We both delighted in the musical, warbling sounds coming from our ‘new’ bat detector a QMC mini ‘with directional cone’- basically a tin can that you could clip over the microphone to make it ‘directional’ – oh the sophistication! (things were so much simpler in those days). When Dave and myself started going there, the building had been partially re-roofed using asbestos sheets. Prior to this, the west elevation was corrugated sheeting; the east elevation still had natural slates. The original roof would have been all natural slates and ‘four-hipped’. It was in the early 1980s that the roof was stripped and improved and, during the re-roofing process, the portico on the east elevation was ‘lost’, as were the hip-ends. Monetary constraints meant that only the northern two-thirds of the building was re-roofed; the southern third was left open to the elements. Unbeknown to anyone at the time, the asbestos sheets caused a problem with the internal temperatures, for they failed to attract and retain solar heating. The following summer, the bats did not breed. To overcome this, the roof was covered in manure to darken it, followed by installing some very long greenhouse heaters. These were eventually replaced with bespoke, industrial-grade electric blankets. I’m pretty confident that this is one of, if not ‘the’ longest monitored greater horseshoe site in the UK. I know that Andrew Watson and Michael Blackmore visited the site in the 1950s and ringed bats; Bob Stebbings and Henry Arnold continued in the 1960s to the early 1990s and I have been monitoring the site since then. On one of these evenings, whilst Dave and I was sitting waiting for the bats to emerge, we heard a car pull up in front of the building: it turned out to be Henry Arnold. Henry worked at The Institute of Terrestrial Ecology (ITE) and was my trainer and mentor, and tested me on my knowledge of bats prior to getting my first bat licence. He also taught me how to catch bats using a hand-net and how to attract bats closer by using a length of grass (yes it does work, and no, I’m not going to explain further). “Would you like to come inside later, to help me with the baby bats?” he asked. Would we? Not-half! Neither of us had seen baby greater horseshoe bats before so we weren’t going to pass up this opportunity lightly. After the adult bats had left, Henry took us inside – it was a bit spooky: all the floors had been removed and all that remained were the old walls and a new loft floor, some 20 feet above us. After the long climb up a creaking aluminium ladder, the loft door was opened and we could hear the baby bats squeaking. The biggest impact was the smell – boy did it smell! The babies were clustered in an incubator, warmed by an industrial-grade electric blanket – still, the baby bats enjoyed the warmth and they got particularly vocal when we shone our torches at them. Henry took one baby down and examined it: in his note book he recorded its gender and measured its forearm. He took out a pair of scissors and cut off the bats 1st toe-nail (making it bat number one). I wasn’t aware of why he needed to mark the babies, but this became clear a bit later. Henry handed me the bat – my first time in a greater horseshoe roost and I was handling a baby greater horseshoe (and taking part in some ‘real’ research’). On the second bat, Henry cut off the 2nd toe-nail, on the third bat, the third toe-nail, and so on. It was when we reached the 11th bat I was wondering what Henry would do; no problem, it was toe-nails one and two, then one and three, one and four, and so-on. Thankfully, in those days there weren’t too many babies being born (I think it was around 25 animals in total), so no babies had more than two nails cut off. After about an hour we had completed the work, just as the first mum returned to find and feed her baby. It was then the reason for marking each bat became clear. By marking the bats they could record how each bat had grown in the intervening period and answer questions like; does cold weather slow growth or warm weather increase it? It’s all pretty clear now but, even in those days some aspects of bat ecology were still unknown. 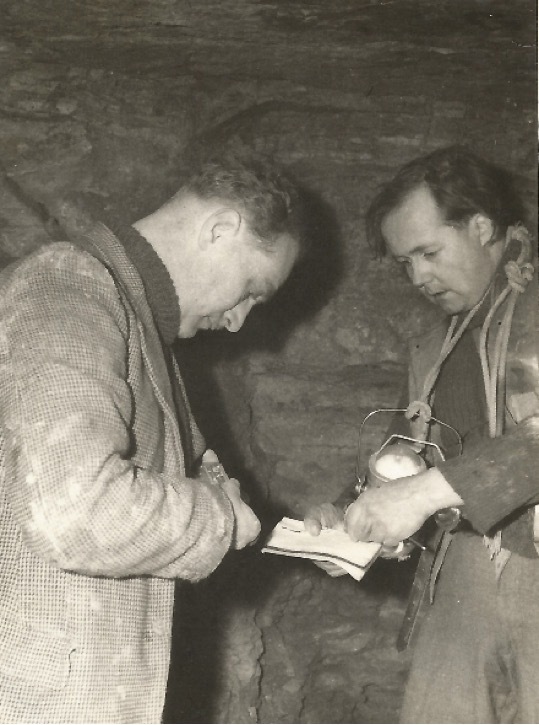 Andrew Watson and Michael Blackmore were some of the pioneers of ringing research in the UK, and ringed bats from Bryanston were recorded roosting in the abondoned stone quarries to the south, on the Isle of Purbeck, and north to stone mines in Wiltshire; showing how far the bats travelled between summer and winter sites. 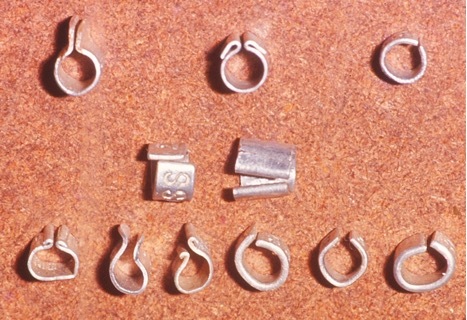 Some of the first rings used. Designs have improved since these early days. Michael Blackmore hands down baby bats to Andrew Watson, in the late 1950s. The east elevation showing the Portico section of roof that was removed during the first re-roofing process. 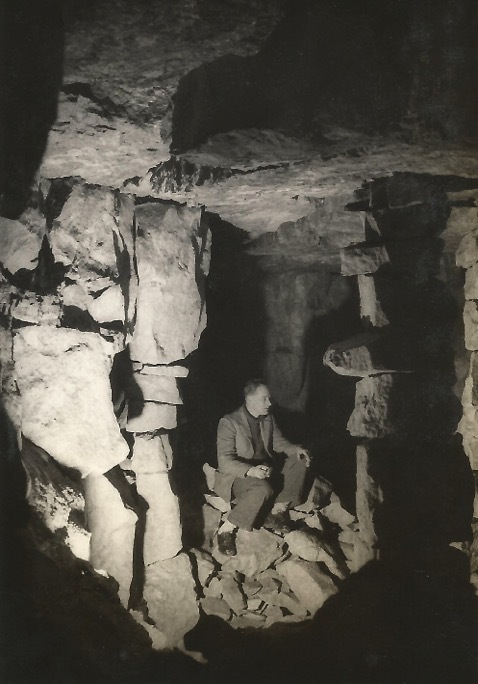 Michael Blackmore enjoying a spot of lunch whilst sitting under a cluster of hibernating greater horseshoe bats – something we wouldn’t do today. Michael Blackmore and Addrew Watson recording data in a Purbeck stone quarry. I still have Andrew’s notebook, started in 1956 (before I was born! ).